No other orthodontic treatment has made shifting teeth so simple and easy like Invisalign. Their customized aligners help you achieve a straighter smile in less time and more comfortably than ever before. However, this innovative treatment has left many people in disbelief and asking questions, mainly on how to keep them clean and what the best cleaning solution is. Today, we’ll be discussing exactly that as well as many other questions the dentist hears. While clear aligners do require maintenance, it’s negligible compared to what you’d need to do with metal braces. If you want the most thorough cleaning possible, it’s recommended that you use Invisalign’s unique blend of cleaning crystals. These can be found online or directly from a dental provider. A great time to sanitize them is during your daily oral care routine. After removing them, simply rinse them with cool water and place them into the cleaning solution. Once sterilized, use a toothbrush to remove loose food debris. Food can get in the way of your treatment, so make sure they’re completely clean before wearing. Do NOT under any circumstances use hot water to clean your aligners. This can permanently warp the plastic and damage them beyond repair. Most people know that they can’t wear their aligners while eating or drinking beverages other than plain water, but you should know that loose food debris stuck in your teeth can stain them if they carry a rich pigmentation. For this reason, it’s important to brush your teeth afterwards if your last meal consisted of staining foods. For example, tomato sauce and dark berries can stain aligners if stuck in teeth. You should sterilize your aligners before your oral care routine and any time they’re exposed to an unsanitary environment. If you drop them on the ground, you don’t want to introduce your mouth to foreign material that could interrupt your treatment or make you sick. In the event that you don’t have cleaning crystals, a simple denture cleansing solution will work as well. The first step should be to contact the dentist right away. 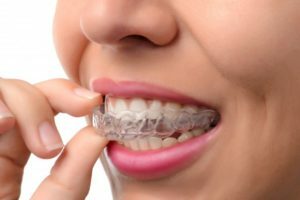 To keep you on track for realignment, they’ll determine whether it’s sufficient to move on to the next pair, move back to a previous pair, or have the broken or lost aligner replaced. Aligners must be replaced through the dentist you began treatment with. Since they’re a prescription item, they’re not something you can replace unless you have permission from the dentist first. Always contact the dentist directly if you need replacements. Got another question that wasn’t mentioned? Schedule an appointment with Dr. Mitchell today to check your aligners and your smile! Dr. Bradley Mitchell earned his dental degree from the University of Oklahoma. He’s more than capable of performing an Invisalign consultation and getting you started on your journey to a straighter smile. To learn if Invisalign is right for you or simply learn more about the practice, you can contact him through his website.